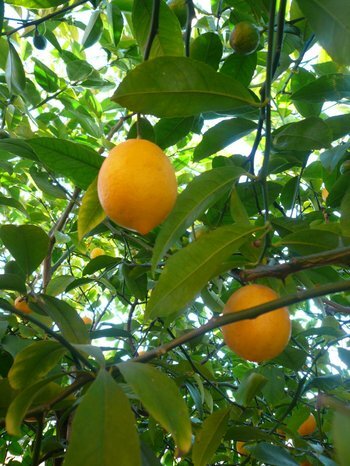 A few weeks ago I wrote about an abiding passion for the lemons that grace our garden. Heaving with fruit, the tree, if I was to savour its bounty, needed some serious harvesting and some serious preserving. North African preserved lemons were quickly followed by pickled lemon slices that sit prettily in their large jar, layers interspersed with sprinklings of paprika, topped to the brim with golden olive oil. Recipe courtesy of Claudia Roden. (I think I love this woman. No, seriously). Putting them away felt wrong, so there they sit on the bench for me to admire daily. When the sun hits them, briefly in the morning, nothing seems more cheerful. Still, the tree heaved. 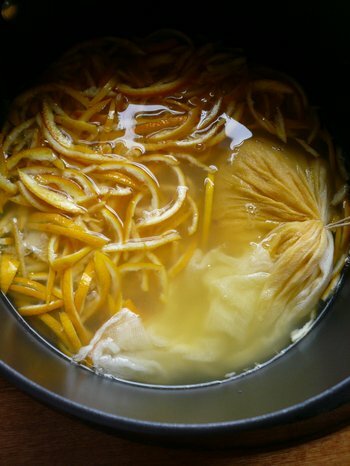 Next, a large batch of bitter-sweet Meyer lemon and vanilla bean marmalade, something I finally cracked with help from Tamasin Day-Lewis. For the uninitiated Tamasin seems bossy, her methods and tone demanding. But it’s for your own good, people. It was worth every second of my devotion. Soft-set, golden and wobbly. I can’t stop eating it, straight from the jar with, it has to be said, a large spoon. 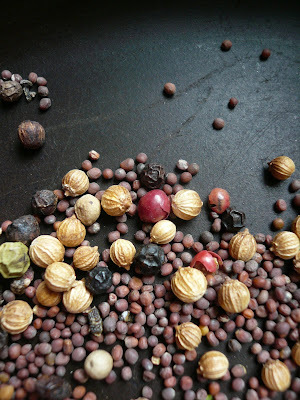 Of all the things one can cook with, make magic in the kitchen with, spices are the most intriguing. There’s a world of opportunity in a spice rack. Time for a chutney. A hot, spicy Indian one. Last year when I first made this, I didn’t know what to expect. It comes from Julie Sahni’s excellent Classic Indian Vegetarian Cookery, a book without pictures; a book full of authentic and aromatic food. My favourite kind. 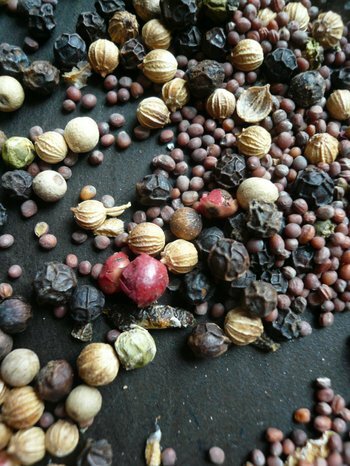 The spices seemed bold and the method unlike any other. In her introduction she states, ‘Anglo-Indians have their chutneys, too, and here is one. It’s easy to make, as are most Anglo-Indian foods…’. Easy? Well, I don’t know about you, but I love seeing that particular word in any ‘preserving’ section. In a word, it’s sensational. But be warned. 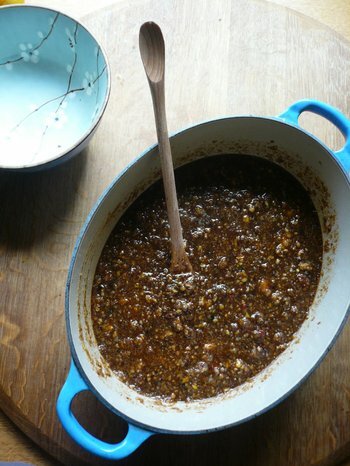 This is not a chutney as many people would know it, not something you’d be spreading thickly on a cheddar and tomato sandwich (though, come to think of it, thinly spread isn’t a bad idea); rather it is a balance of all the flavours that makes the foods of the sub-continent so irresistibly unique. Hot, sour, salty, bitter, sweet. It livens up anything even vaguely Indian –anything using paneer cheese or silky eggplant. Pulses and grains welcome its hot sweetness too. Once made, put it away and leave it alone for a full month to mature. In two weeks it will just be ready, but you’ll thank me if you can be patient for another two. And I especially like the Indian name for it, Nimboo Chatni. Much cooler. Adapted from Classic Indian Vegetarian Cookery by Julie Sahni. I’ve cut the amount of chilli considerably, mostly because I’m a chilli wimp. If you like things to be searingly hot, by all means up the chilli. But you’ve been warned, okay? This will take three days, but it’s ridiculously easy. Gently crack the cardamom pods and release the seeds. Discard the green pods. Place a heavy-based frying pan over a medium heat and when hot, add the spices. Shake and toss the pan constantly until they start to smell enticing – a matter of about 3 minutes all up. Remove to a plate and cool completely before grinding to a powder in either a clean coffee grinder or with a mortar and pestle. Halve and juice the lemons. Strain the juice and set aside. Discard 6 of the lemon shells, leaving you with 18 halves. Add these to the bowl of a food processor along with the onion, chillies, ginger and raisins. Whiz until finely minced. Tip into a large bowl and stir in the ground spices, reserved juice and the cider vinegar. Mix to combine, cover and leave at room temperature for 2 days. Uncover and transfer to a non-metallic pan. Add the sea salt and sugar and gently bring to the boil over a low heat, stirring often. Cook, uncovered, gently bubbling, for 30 minutes. Stir from time to time, but stand back – it has a tendency to spit and burble, like a small volcano towards the end of the cooking time. Sterilise 3 or 4 jars while it’s bubbling. There are lots of guidelines out there, so follow your preferred method. While hot, ladle into the jars, seal tightly and invert until cool (this creates a vacuum). Store right way up, for at least 2 weeks before eating, preferably 4 weeks or longer, and refrigerate when opened. Easy and very good. It will be ready just as we get home from our travels. Huge crates of asparagus are appearing at the market, beautifully boxed, heads held high, their necks gracefully, delicately, bowed. Asparagus is the star of spring. Undeniably. Love the stuff. But I’ve been waiting for an older, ancient crop, one a little less regal. One of the oldest domesticated plants. One with a suitably rich and varied history. 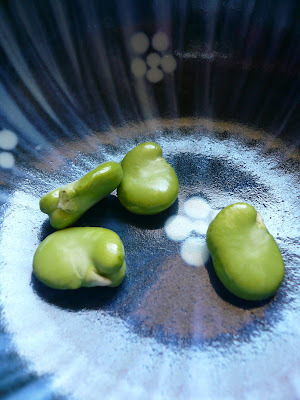 Broad beans or fava beans, tend to evoke bad responses from many (mostly English) people. My father takes great exception to them (though he's not English, so there goes that theory). I have a sneaky recipe up my sleeve for just such a person, a salad, one that uses broad beans, double-peeled and generously dressed with lemon, garlic, olive oil, smoked paprika and cumin. A tin of chickpeas, drained and rinsed is tossed in along with massive amounts of fresh coriander and parsley. I’ve not met a soul who didn’t fall for it – there’s hope for the unconvinced yet. Once peeled you can roughly pestle them to make a chunky sort of pesto mixed with some fresh mint, chives and goats cheese. Great piled high on garlicky toast. Another winner. Split the pods and you’ll find them softly swaddled, like precious, sleeping babies. Peel away those skins and they emerge naked, a bright lime green. Delicious. In Greece broad beans are served raw, the whole pods dropped in a loose tangle in the centre of the table, a bottle of ouzo placed on the side. I can’t help myself when podding – raw they possess a crunch and green-ness unmatched by the more pedestrian pea. One for the pot, one for me. You don’t even need the ouzo, really. A tough, grey, water-logged bean is a waste of both your time and energy. Blanch the podded beans in rapidly boiling water for sixty seconds, refresh them in ice-cold water and drain thoroughly before slipping off each bean’s little pale overcoat. An easy enough task, yes, but I sometimes prefer patiently peeling them, unblanched, with a sturdy thumbnail. Releasing each bean, dropping it into a bowl and hearing it plink against the surface offers a gentle, rhythmical sound, one that nearly manages to cancel out the screeching and honking of peak hour traffic filtering into the garden. Nearly. I’m writing this now because I want to make use of the Australian spring before we disappear for a few weeks. Make hay while the sun shines as the saying goes. Spring here is short-lived; the transition from gentle warm days to fierce summer heat happens in the blink of an eye in this drought-ravaged country. And the Artist and myself are leaving on the first of October for a much needed holiday. New York, Madrid and a blissful week roaming the beaches of San Sebastian, sketchbooks and notebooks in hand. And wouldn’t you know it? Right smack bang in the middle of our spring. The ravioli or gnocchi is an addition, a good one, that will make this meal more substantial. Get them cooking while you chop the vegetables, that way they’ll be ready to slip in when the time is right. And don’t for even a second think that I would suggest you make your own here. Not even I am a martyr to that cause. Pod the broad beans. 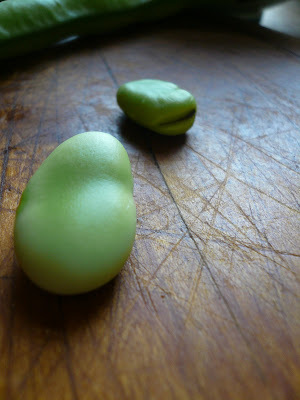 Peel the pale green layer from any beans that are larger than your thumbnail. Set aside. Snap off and discard the woody ends of the asparagus by taking the spear between both hands and bending it. Where it seems to want to snap naturally is exactly where you should do so. Slice the spears diagonally into three. Set aside. 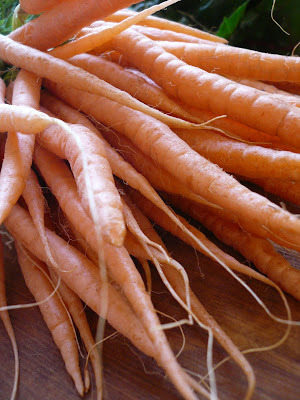 Remove the feathery tops from the carrots, leaving about 1-2 cm’s of stalk attached to each one. Any carrots thicker than your index finger should be halved lengthways. Thinly slice the snow peas on the diagonal. 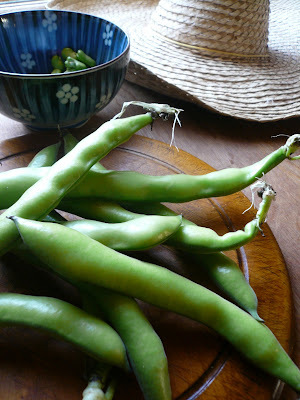 Set aside with the broad beans. Warm the butter and oil together in a large, lidded frying pan or a wide, heat-proof casserole over a medium heat. Add the onion, thyme and carrots and fry, stirring often, for 5 minutes or until lightly coloured. Pour in the wine and let it bubble away to almost nothing. Add the water, followed by the asparagus and a good pinch of salt. Place the lid on, lower the heat and cook for 6 minutes or until the vegetables are tender at knife point. Lift the lid, give it all a gentle stir and drop in the broad beans, snow peas and spinach leaves. Replace the lid and continue to cook for another 2-3 minutes. Turn off the heat, lift the lid and drop in the cooked ravioli or gnocchi. Gently stir. Crumble over the goat’s cheese. Sprinkle with the chopped parsley and drizzle with a spoonful (or more) of extra virgin olive oil (or butter). Replace the lid and rest for a moment or two. Serve in wide soup plates with the wedges of lemon. 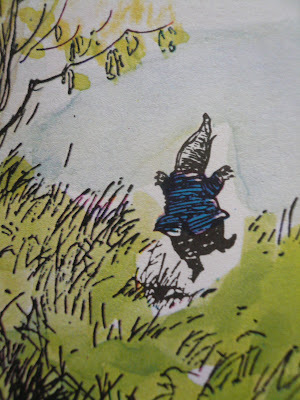 That first paragraph of The Wind in the Willows is one of the most delicious beginnings to any book I know. Like Mole, my tidying had been halted and was to be so for a couple of lazy, book-filled hours. Alphabetising has its charms. I wouldn’t have come across another gem, placed by me on the wrong shelf had tidying not been firmly on the brain. Melinda of Melbourne Larder wrote in July about a rather grandly-titled Bible Cake, a recipe gleaned from her beloved grandmother’s cookbook. 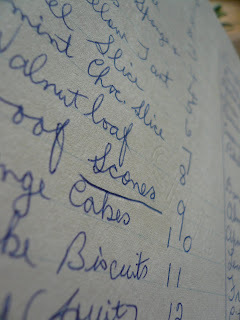 I too am custodian of my grandmother’s recipe book, written in her familiar, slightly wonky hand writing. Unsurprisingly there was no need to fight for it given the tiny size of our family. I asked. I received. 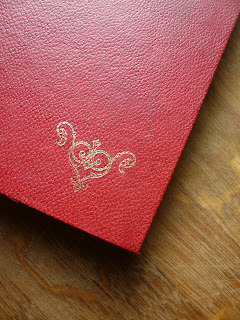 The book itself, hand-bound in red, was made by my father and stands as a reminder that bookbinding is a skill high school woodwork teachers, those younger than dad, no longer possess. Shame really. I would have enjoyed the Industrial Arts a great deal more had I learned to wield an awl, sew booklets of paper and stretch leather over thick layers of board. Mind you I did make a barbeque fork with an excellent double twist in the handle in year 7 metal work, long since lost in my travels. Haven’t ever had a barbeque to use it on. How un-Australian. Grandma learned to cook as a servant, in the kitchens of much grander homes. She wasn’t a fancy cook. No deep-fried lemon zest in these pages. Baking was her thing, and very good at it she was. 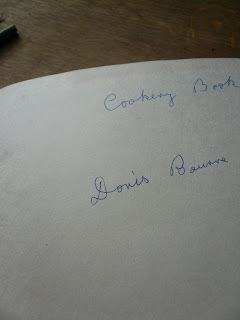 In fact there are only two savoury recipes in the whole book – one for Quiche Lorraine and another for Cheese Scones. There are recipes with wild names like Impossible Pie and Champagne Pastry; recipes attributed to women who, like my grandmother, are no longer around. But my favourite by far is a recipe for Mock Nougat Bars, an oat-y, chewy slice that sounds very like something copied, possibly, from the Australian Women’s Weekly in WWII – a substitute for something exotic in far leaner times. 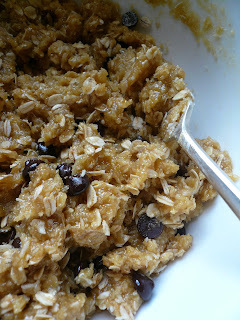 Unthinkably easy to make and very adaptable, I like to imagine that the oats and wholegrain flours make up just a little for that whole cup of sugar, but I’m fairly sure that I’m fooling no-one but myself. Mock Nougat Bars Why Mock Nougat? Who knows. It’s had many incarnations in my lifetime. This, then, is the current favourite. Add any dried fruits or nuts you like, use all white flour, omit the chocolate. Sweet spices like cinnamon and ground ginger work very well. Over to you. It’s dense and chewy and a good-ish snack every once in a while. 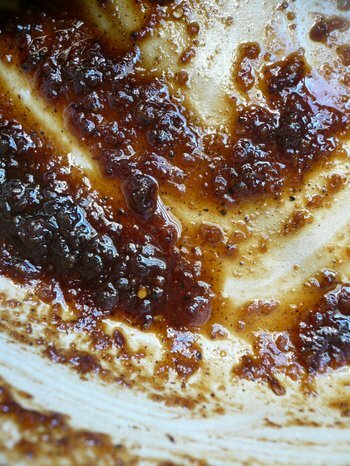 Melt the butter and golden syrup together over a low heat. Cool. 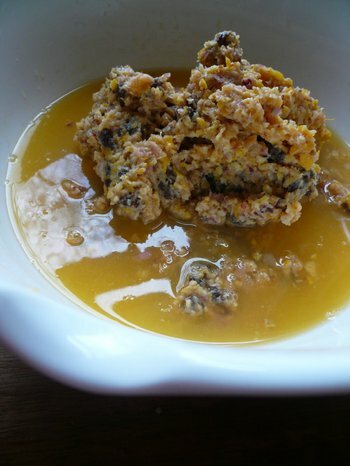 Mix the dry ingredients together, add the cooled butter and golden syrup, followed by the beaten egg and mix well. Mix in the ginger, fruit and chocolate chips. Spread out in a baking-paper lined rectangular tin (approx 20 x 30 cms), pressing down with the back of a spoon to even the surface. Bake in the preheated oven for 25 minutes. Cool in the tin and cut into fingers while still warm. I don't think she'd mind me sharing it with you. Throughout my twenties, moving from house to house, the one thing that determined if a property was just right, was access to a lemon tree. Be it a branch, laden with fruit, hanging over the fence, a neighbourhood tree from which a little pilfering now and then in the dark would not be detected, or, better still, a tree of my own, this simple rule has kept me in good stead. I love lemons. Growing up in a typically Australian suburb on the (then) outskirts of Sydney, the lemon tree with its thick gnarled branches was the most useful plant in our otherwise very English cottage garden. The fruit was thick-skinned and the juice particularly sour. I used to mime to ABBA songs with a girl from next door who would eat the lemons straight from the tree, wincing, but soldiering on as if on some sort of mission. Good Lord. My lips still curl at the thought. Lemons are simply indispensable in the kitchen. Cooking, indeed eating without them would be unthinkable. Anna Del Conte in Amaretto, Apple Cake & Artichokes says, ‘I feel totally lost when I discover I haven’t got a single lemon in the larder’. Might I add to that a lemon within short walking distance? When we moved here a full twelve months ago, the giant, showy cumquat tree that swamps the front garden overshadowed the lemon, its dark leaves lurking in the far corner of the eye. What a lemon tree. One of the down sides of renting is that the garden, like the house itself, isn’t ever really yours to own. You cannot take a garden with you, nor can you make one, a real one, in the space of just a few years. I’ve had a few trees in my time, but this one, a Meyer as far as I can tell, is a corker. Thin-skinned, sweet of flesh and heaving with fruit, it’s a joy – just beware of the stabbing thorns, ever-ready to dig deep into wandering fingers. A Meyer, one equipped with a magnificent defense system, for sure. Should we ever settle somewhere permanently, the first thing I will do is plant a Meyer lemon. Drought tolerant, useful, beautiful. You couldn’t ask for more. What to do with all of that fruit? Salty preserved lemons. Once you’ve got the taste for this uniquely Moroccan specialty you’ll find yourself slipping a finely chopped chunk or two into almost anything. A tray of potatoes, roasted with wedges of red onion and a chopped red pepper or two then tossed with olive oil are lifted by a last minute addition of the lemons. Fresh coriander, smoked paprika and cumin, a downright addictive combination, even love that salt when tossed with fresh young broad beans (double-peeled) and tender chickpeas for a salad doused in grassy olive oil and fresh lemon juice. Adapted, only slightly, from Paula Wolfert’s recipe in Mediterranean Greens and Grains. Ready in seven days. Cut 2 of the lemons into eighths and discard any obvious seeds. 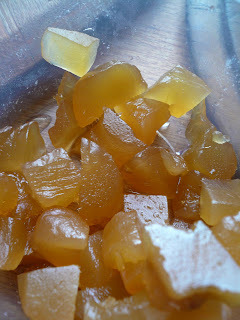 Pack the chunks into a clean glass jar. 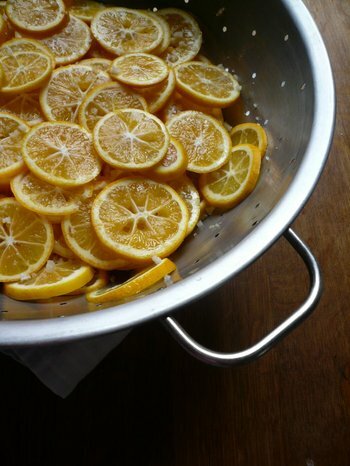 Squeeze the juice from the remaining lemons until you have about 100ml. Add the sea salt and stir. Pour into the jar, secure the lid tightly and give it all a good shake. Leave at room temperature with the lid on for 7 days. Shake the jar once or twice a day during this time. After 7 days the lemons will be ready. Keep in the refrigerator and make sure the top of the jar covered with a thin layer of olive oil after opening. The oil becomes lemony and delicious and is perfect for dressing a salad when you’ve finished the lemons off. To begin with, take one eighth, and very finely chop both skin and flesh adding to your chosen dish. Taste before deciding to add more (I always seem to add more). Many recipes tell you to discard the flesh and use only the skin, but I’ve never found that to be necessary. Keeps, at the back of the fridge, for about 12 months. But don’t wait that long. Here’s something well worth being the first thing you might make with those lemons. For Christina, an excellent gardener. The only fancy bit of equipment you need here is a (very cheap) pastry brush. 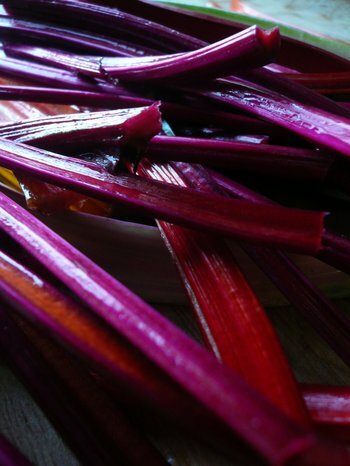 I also add the beetroot stalks, chopped and cooked with the chard stems when they are fresh and look snappy. The filling goes all pink and green – very pretty. Soak the currants in freshly boiled water for 20 minutes. Drain when ready. Toast the pine nuts in a dry pan until golden, tossing all the time – they must not burn. Cool on a plate and set aside. 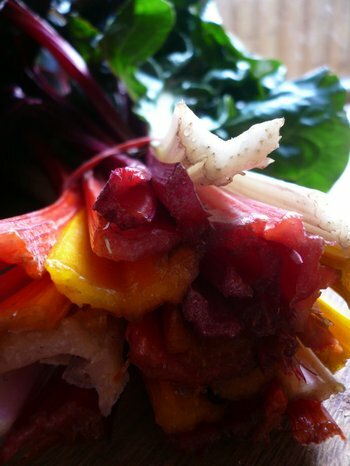 Separate the rainbow chard leaves from the stems. Trim the stems and cut into small dice. 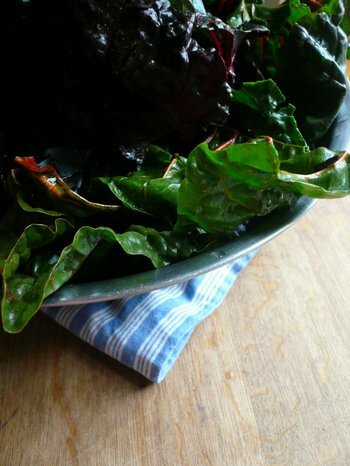 Wash the leaves, shake them dry and then roll up and slice thinly into ribbons. Heat 2 tablespoons of the oil in a heavy-based frying or saucepan and sauté the onion until pale gold. Add the stems and garlic and cook over a medium heat, stirring often, for 5 minutes. 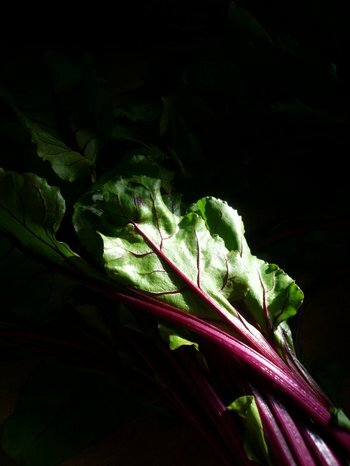 Add the sliced chard leaves to the pan, followed by the beetroot or rocket leaves and trickle over 1 more tablespoon of oil. Cover the pan until the leaves have softened, then remove lid and stir well. Add currants, a pinch of salt and toasted pine nuts and cook, lifting and turning, until the stems are tender but the leaves are glossy and green. Break the eggs into a large bowl, beat briefly with a fork and crumble in the feta. Add the preserved lemon and a good grinding of black pepper. Tip in the chard filling and gently mix. Brush shallow ovenproof dish with a little of the melted butter. Unfurl the whole packet of the pastry on the bench and place a clean tea towel on top. Use 4 or 5 sheets of pastry to line the prepared dish, overlapping and letting the edges hang over the sides. Pour in the filling. Crumple the overlapping edges of pastry on to the filing. Brush the remaining sheets of pastry liberally with the butter, crumple each sheet and arrange over the top, ensuring it is completely covered. Bake in the preheated oven for 30 minutes until the filling is set and the pastry golden. Cool slightly before slicing. There are many other ways to use a lemon too. Watch this space.